We’d love your help. Let us know what’s wrong with this preview of The Space Between Houses by Christian Laforet. There are unexplained noises outside that can wait until morning. There are phone numbers that should never be called. There are places where being rich and famous means a fate worse than death. There are shortcuts you’re better off avoiding, like the space between house… Walk the paths of madness, horror, and revenge in the debut collection from author Christian Laforet, There are unexplained noises outside that can wait until morning. There are phone numbers that should never be called. There are places where being rich and famous means a fate worse than death. There are shortcuts you’re better off avoiding, like the space between house… Walk the paths of madness, horror, and revenge in the debut collection from author Christian Laforet, featuring ten stories that prove it’s always easier to see the light when you are standing in the dark. To ask other readers questions about The Space Between Houses, please sign up. This collection was fun and the prose flowed well, making it easy to read and hard to put down. It was a challenge, when I was otherwise busy, to not say to myself, "I'm almost at the end, just a few more pages. Oh, this next story's only 5 pages long, I'll just read it quickly," and then end up late. Which is a compliment to the author, of course. I can see his influences, which seem to be Stephen King, maybe Pulp Fiction (at least one scene), and the Made for TV horror movies of the 80s, maybe This collection was fun and the prose flowed well, making it easy to read and hard to put down. It was a challenge, when I was otherwise busy, to not say to myself, "I'm almost at the end, just a few more pages. Oh, this next story's only 5 pages long, I'll just read it quickly," and then end up late. Which is a compliment to the author, of course. I can see his influences, which seem to be Stephen King, maybe Pulp Fiction (at least one scene), and the Made for TV horror movies of the 80s, maybe a little Twilight Zone or Tales from the Crypt. They definitely have that feel. My only complaint is that a couple of the endings, particularly the last story of the book, and the one with the 2 sisters on the fishing boat, were left just a touch too wide open for me. Overall, a solid collection of short stories, by a new, up and coming horror writer. For the most part, these stories focus on human horror, with a monster story thrown in. A couple of the stories did truly stir me emotionally. Why? I can't say....you have to find out by reading this brief collection! Loved the local flare that popped up. 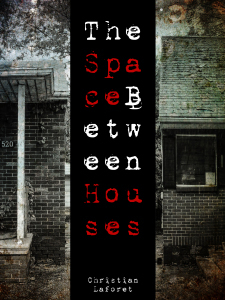 Disclosure: I purchased my signed copy of The Space Between Houses from the author. We are both members of the same writing group, but do not communicate outside that group. I have never had any communication with him about this book except at time of purchase. The comments that follow are my own personal opinion. I received NO compensation of any kind, or from any one, to provide this review. This is one creepy book and I loved it. It incorporates ten short stories covering all kinds of situatio Disclosure: I purchased my signed copy of The Space Between Houses from the author. We are both members of the same writing group, but do not communicate outside that group. I have never had any communication with him about this book except at time of purchase. The comments that follow are my own personal opinion. I received NO compensation of any kind, or from any one, to provide this review. This is one creepy book and I loved it. It incorporates ten short stories covering all kinds of situations that leave the reader looking over his shoulder and turning lights on. Henry, Old Wounds, and Trapped I really enjoyed, but Summer’s Friend was definitely my favorite. This writer leaves the finale to the reader and sometimes it’s frustrating, but overall this book is great fun. I loved it and anyone who enjoys a good scare will find everything they want in this little package. This is the author’s first book and I’m waiting patiently for his next one. His style is unique and worth reading. I would recommend The Space Between Houses to any horror lover. I was handed the book by a colleague who knew the author back in school. As an aspiring author myself, I was impressed by the diversity in the short stories. Topping the list was Summer's Friend finding a likeness to HP Lovecraft. I try not to compare amateur vs professional, but the author seems to take kindly to similar styles such as Clive Barker and Stephen King. I read the entire book in a little less than 2 days so I can say without a doubt that I was curious to see each story's end, and wa I was handed the book by a colleague who knew the author back in school. As an aspiring author myself, I was impressed by the diversity in the short stories. I read the entire book in a little less than 2 days so I can say without a doubt that I was curious to see each story's end, and was pleased enough by each. I would have rated a little higher than 3 stars but that doesn't indicate a lack in quality of his stories. It's simply the fact that many of his stories felt a familiar tone to the aforementioned authors and I was hoping for a bit more originality. Disclosure: I have known this author for a few years, but had never read any of his work. We shared table space at a book show, and to overcome the boredom I purchased this book. I've never been a fan of horror stories or movies, but I have to admit I liked The Space Between Houses. Not being a horror fan, I was pleasantly surprised by Laforet's masterful buildup of suspense in his stories, to a climax that doesn't necessarily vividly describe the blood and guts and colorful details of a victim's Disclosure: I have known this author for a few years, but had never read any of his work. We shared table space at a book show, and to overcome the boredom I purchased this book. Not being a horror fan, I was pleasantly surprised by Laforet's masterful buildup of suspense in his stories, to a climax that doesn't necessarily vividly describe the blood and guts and colorful details of a victim's death. Instead, the author takes you right to the edge of the story, and in some cases gives you a nudge over the cliff, but in others he leaves you hanging there. The stories are short, but fill your imagination. There are even underlying moral questions that the reader can ponder or maybe even fret over. I thought this book deserved four stars, but couldn't think of anything wrong with it, so I felt it deserved a top rating. Excellent stories, varied and creepy. I felt nervous and worried for most of the characters in the stories. The author managed to get me more attached to the characters with few pages than some books can with entire chapters. If you are a horror fan and like short stories - this book is an easy choice. - Excellent stories for horror fans. - The writing gives the reader a sense of panic - in a good way. - A little on the short side at - wish there was more. This book contains 10 short horror stories. The author does a great job of telling each unique tale in a different, still chilling way. Most stories I was sad to complete. This aurhor has a great story telling gift that leaves the reader wanting more. Personal favorite - Ashes and Secrets. I need to know more! Recommend this book to anyone looking for quick and intriguing scares. Can't wait to read more from Christian. Ten tales of the macabre told with chilling resolve. The stories are, for the most part, short and deadly. The author weaves both mystery and horror into each tale, often leaving the reader wondering what next. If you like the grisly side with punch, you'll enjoy these twisted sojourns into the dark. 10 quick shots of horror...some burn going down, some you savour and some you sip on because you do not want it to end...hoping for more in the future. I read the book is was great. The storys I read I wanted to read more. They were very interesting enjoyable exciting and scary. You should read this book to find out your self. First story was fantastic but the rest were just okay. Still very enjoyable! Do you like horror? Great! This is the book for you. It's got horror in spades. Not sure if you like horror, but like to read good stories, this book has you covered there too. Christian gives you a taste of every type of horror story in one convenient package. Each story gets under your skin and sticks in your brain in a different way. From creepy, to terrifying, disturbing to disgusting, I keep this book right on the shelf, where I can keep an eye on it. Do yourself a favour and get this book be Do you like horror? Great! This is the book for you. It's got horror in spades. A devil’s advent calendar of nasty surprises! You’ll savour each and try to save the next for tomorrow- but you won’t be able to!